Sorry if this post is not relevant to my regular topics but I just couldn't resist. Is this Google's new look? Or is this some experiment that they are running that I am seeing? On a more related note (to my blog that is) I am currently updating a project for a fixed backend DLL for the Pantheios logger (http://www.pantheios.org) that I will upload to my Google Code project soon (i.e. at http://ossandcad.googlecode.com). Will post about that as soon as possible. 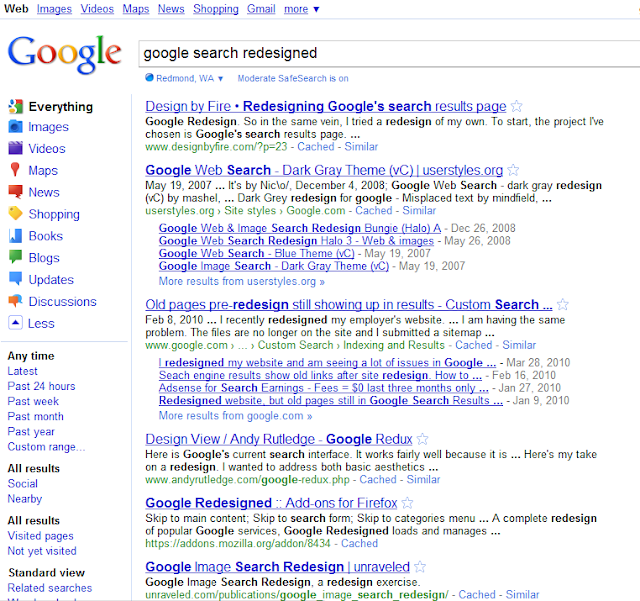 Update April 9 2010: I am currently in New Jersey and don't see the modified Google search page (that I saw from Redmond). So obviously no dramatic changes by Google. Probably just some experiment that they are running that "I" happen to be a "part" of. "Google's new look" is actually "Jazz"